An outside auditor released his findings today at the Nob Hill Room of the Seven Hills Conference Center, which challenged the appropriate utilization of $98 million in SF State financial reserves. 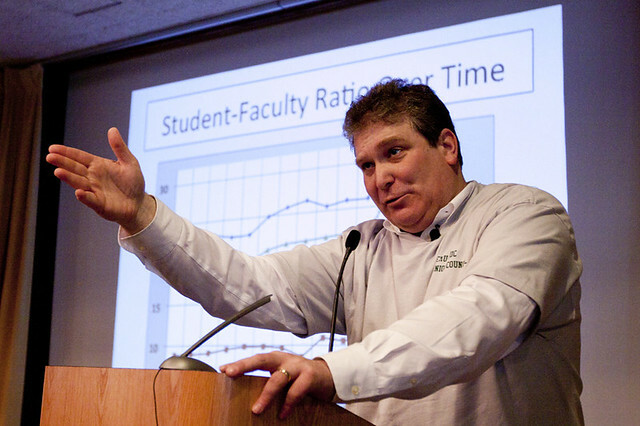 Howard Bunsis, a professor of accounting at Eastern Michigan University who has done similar analyses at CSUs Humboldt and Dominguez Hills, was appointed by the California Faculty Association SFSU chapter to evaluate campus spending. He detailed his findings that state there is no reason for cuts to faculty and students but rather costs of the administration. According to Bunsis, SF State currently has $78 million in restricted reserve funds and $20 million in unrestricted reserves. Cuts should be made in a particular order, but should begin with assessing reserves, he said. Bunsis, who attained a Ph.D in accounting from the University of Chicago and is a certified public accountant, said reserves should be used first, the number of administration should be cut second, a reduction of salaries to the administration third, a reduction to the budget of the administration should be executed fourth and as a final resort students and faculty should be cut. The University accounting office, Bunsis said, has documents detailing budgetary issues, but is not allowing those affected by them to see them. With the average cost per member at $230,000, he said, the administration is the largest academic unit with 214 employees. Bunsis noted that with a 20 percent reduction in administration positions, the University would save $5 million. Bunsis also challenged the University Planning Advisory Council’s recommendation to reorganize the eight colleges to a six-plus-one structure in order to save the University $1 million. Despite pointing out the flaws in the manner funds are disbursed, Bunsis said that he did not believe the administration was being wasteful, but that they were spending money incorrectly by compromising students and faculty. take a look at the new “creative-arts-center” nice building, but was the land-grab essential to the future rebuilding of an existing building on site. SFSU-CSU also is co-funding the City College one as well. if you tack on the housing maintenance, capital planning administration, and costs of consultants and you have quite the gravy train of overpaid administrative positions…. its real cushy working near corrigan, even one of Fiona Ma’s assistants is now working at SFSU-CSU. Makes a lot more sense to bulldoze the administration building and place the center up along 19th Ave. or at the Stonestown / SFSU site over adjacent to the transit stops. Instead there will be larger traffic/transit impacts un-addressed in the development by CSU-SFSU. The total impact and cummalative impacts are CEQA related concerns un-addressed by the SF BOS Land-Use committee and SF Planning Department in the actions/activities of the SFSU Capital Planning group. Leland Yee should be looking very carefully at this issue, the expense alone of the land and the building signal improper use of funds that should be earmarked for fixing the access issues of SFSU and education access for low-mid income students. Students should be picketing this issue all the way to corrigan’s office. Its great to have a new creative arts center, the process however was flawed from the start.